EFM has the completely automatic motorcycle clutch for you. At Bikes Built Better we have taken a lot of joy in helping customers through no fault of there own are no longer able to ride a motorcycle in the conventional manner. Whether it is age an injury or medical condition we love to help the motorcyclist who wants to ride but can't get back in the wind. This product "The EFM Auto Clutch" is one of the products we found that helps us make riding possible again and it works great. Even if you don't have a disability some people just like the idea of being able to ride without needing to use a clutch. This clutch works great! If this no need to use a clutch solution sounds good to you bring in your motorcycle or if need be we can have it towed we will remove the clutch pack ship it to EFM and reinstall the modified auto clutch and test. This process can take 1 to 3 weeks depending on the manufactures work load but is a solution that is worth the wait. Whether you have an American or Metric, Street or Dirt, Motorcycle, Stock or Custom Configuration, EFM can make an automatic clutch for your motorcycle. The auto clutch features: No need to use your clutch lever, More holding power than your stock clutch, Bolt on applications for '90+ Big Twins, Ideal for disabled riders & jockey shifts, Harley & Metric Applications. 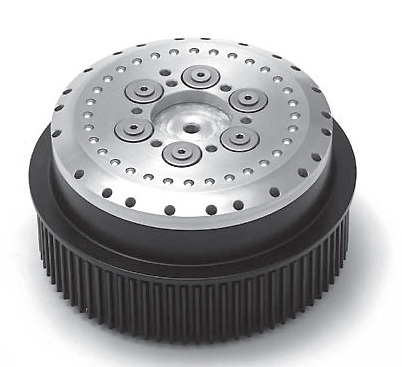 The Auto Clutch offer significant improvement over both stock and other aftermarket clutches. While Lock Up clutches only work when the bike is moving, the EFM auto clutches are based on engine RPM so they react to throttle input, not bike movement. This allows for instant lockup for burn-outs on any bike and unsurpassed holding power. What does the EFM No-Stall Auto Clutch do? The EFM Auto Clutch is a automatic pressure plate designed to work with ANY TYPE OF BIKE. The EFM Auto Clutch allows the rider to take off and stop simply by using the throttle and with out touching the clutch lever. Smooth acceleration and stopping with out the worry of stalling the motorcycle. Does the EFM No-Stall Auto Clutch have a warranty? The EFM No-Stall Auto Clutch comes with a life time warranty material and workmanship. What models does EFM No-Stall Auto Clutch work with? All, no matter what you drive, EFM has been in the motorcycle industry since 1990 and making auto clutch’s for over 10 years. EFM is the manufacturer. We started making the EFM No-Stall Auto Clutch 1996. We have them for street bikes and dirt bikes. What kind of primary does the EFM No-Stall Auto Clutch work with? Any and all, we make them for every type of primary, wet or dry, open or enclosed. EFM has its own engineering department with state of the art CAD-CAM to go from design to working model in 1 DAY--WE ARE THE CLUTCH EXPERTS! Does the EFM No-Stall Auto Clutch automatically shift gears? No, the EFM No-Stall Auto Clutch assembly is a automatic pressure plate. You still have to shift gears. You can still use the clutch also if desired only with MORE HOLDING POWER then any stock or after-market clutch out there. Do I need to keep the clutch lever? EFM recommends you still to have a manual clutch lever. You can still use the clutch lever for shifting, but with 1 finger pull for normal shifting rpms. Do I need to adjust EFM No-Stall Auto Clutch? No, once the unit is set up, it will work that way for a long time. Unless you abuse your clutch by taking off in the wrong gear, letting it slip more than normal, etc. you will probably never need to adjust it. What kind of maintenance will the EFM unit need? How do I install the EFM No-Stall Auto Clutch? The EFM unit will replace your stock pressure plate or clutch completely. If you can remove your stock clutch, you can install the EFM unit. Do I need to modify my bike to fit the EFM No-Stall Auto Clutch? No, this unit is a direct replacement to your stock clutch. Always check after the EFM is installed for clearance, but they are designed to be a direct replacement to a stock unit. Depending on how many things you have to take off to get to the primary, usually 1- 2 hours. Does the EFM No-Stall Auto Clutch void the warranty? No, Harley-Davidson does not warranty the clutch pack, this is the only thing that can wear out. On the EFM automatic pressure plate, there is NOTHING TO WEAR OUT. Does the EFM No-Stall Auto Clutch work with hydraulic clutch? Yes, the EFM will work with any type of clutch lever, cable, twist or foot pedal type clutch. How much horsepower will the EFM No-Stall Auto Clutch hold? We have tested with 280 hp turbo charged and super charged bikes. We have yet to find one to slip. Whether you have an American or Metric, Street or Dirt, Cruiser or Crotch Rocket, Stock or Custom, EFM has the completely automatic motorcycle clutch for you.